Thomas is the president of the Ontario Public Service Employees Union (OPSEU). He wants Ford to use LCBO stores to sell cannabis: 40 stores to begin with and then locate others based on geography and population. Earlier this year, Doug Ford said he was in favour of the Wynne government’s original plan to sell cannabis through the LCBO. Once elected he changed his mind. Now Ontario has no safe, workable and transparent plan for the distribution of cannabis. 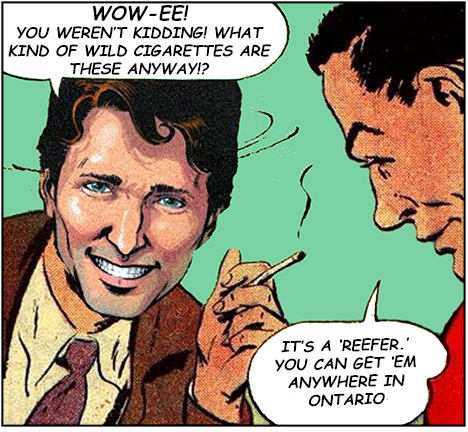 The federal government says the purpose of the new Cannabis Act is “to keep cannabis out of the hands of youth and to keep profits out of the hands of criminals and organized crime.” Ford’s wild west, laissez-faire approach makes such objectives remote, to say the least. A study published in the Journal of Drug and Alcohol Dependency showed declining academic performance and mental health in adolescents who used cannabis. It also found this held true among middle-class youth—countering the conventional wisdom that only low-income youth were susceptible. That means that the negative effects of cannabis on the developing brain don’t end in adolescence. They follow young cannabis users for the rest of their lives. A Nanos research poll found a large majority of Ontarians believe that selling cannabis through our public retailer, the LCBO, would have the best chance of keeping it out of the hands of under-age young people. It’s an option that makes sense for many reasons. For starters, the LCBO is publicly-owned. That means there is no relentless pursuit of profits. There is no pressure on staff to sell as much product as possible to whoever they can as often as they can. Another big plus for the LCBO option is that liquor store workers are trained and supervised to follow the rules. There is no incentive to break the rules. In fact, breaking the rules could get you fired. Not only would LCBO staff be more diligent in keeping weed out of the hands, and developing brains, of adolescents, but they could also act as point-of-purchase health educators. Their mandatory training could include information to pass on to buyers about cannabis use, its range of impairment and possible broader health issues. These are important concerns. There have been cases of private cannabis retailers telling pregnant women that smoking pot during pregnancy was completely fine when, in fact, it can have serious consequences for the developing fetus. A recent study by McGill University researchers demonstrated that cannabis smokers exhibited significant impairment even 5 hours after inhaling, making driving more dangerous. Learning these basic facts could help consumers make better choices. Having staff who are required to participate in mandatory training would make it possible for this information to get passed on to cannabis buyers. Cannabis sales will bring in big profits. Ford’s plan will funnel those profits into private pockets. The LCBO option will secure those profits for the people of Ontario. With Bill 36, municipalities in Ontario are given only two options, allow private retailers to sell pot in whatever location they wish, or opt-out of the process altogether. Unsurprisingly, that’s what many have decided to do. They need to be provided with a third option. If LCBO stores were selling cannabis, this would satisfy many municipalities’ wish to have the product sold in the safest and most controlled way possible. “I really have no bias except that I would like it to go really, really well from a public perception perspective,” said Bruce Linton, the chief executive of Tweed, a marijuana producer in Smith Falls, Ont. Questions have been raised about the connections between former political staffers like Will Stewart and Melissa Lantsman and corporate cannabis. And now we’re hearing about a secret cannabis warehouse that has opened without any information on who has been hired to run it, how they were hired, and whether the jobs were advertised or the workers trained to address issues of cannabis’ relation to health or impairment. In short, Ontario is waking up to legalization without proper oversight or accountability. There was a plan ready that would have protected youth, satisfied the concerns of municipalities, and provided Ontarians with a trusted and responsible way to sell cannabis in the province. The fact that this has disappeared under the current government without proper consultation or coherent explanation should worry every citizen, regardless of whether they’re eager to light up a joint or not.